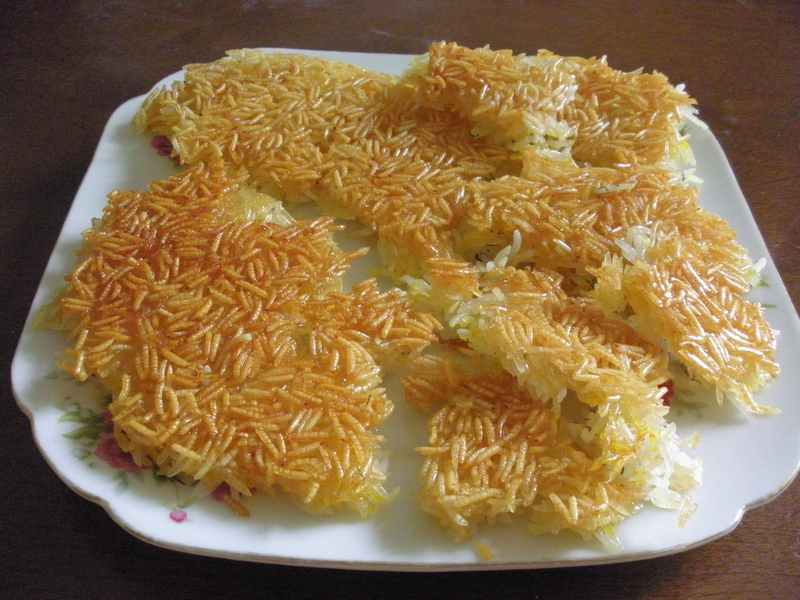 The high quality rice cooked Iranian style is simply unbeatable. 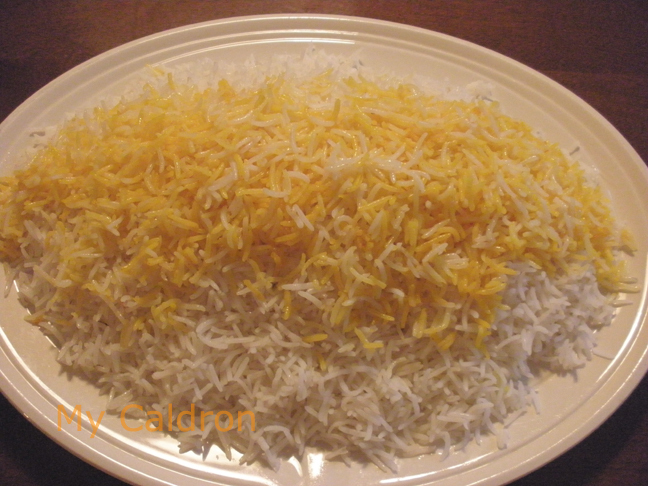 Whether it is mixed polo or plain, white chelo, soaked and drained or not drained (as in kateh or dami), the unique steam-cooking method employed to prepare Iranian-style rice results in a perfection of slender, fluffy grains with a heavenly taste and fragrance. here is a brief instruction as we will be needing it here and now too! Soak for overnight, or at least 4-5 hours in advance in a bowl of lukewarm salted water. Bring about three liters of water to a rolling boil in a big pot with a capacity of four or more liters of water. Pour off the salted water from the top of your rice bowl and add the rice to your boiling pot. Let the rice boil until the magical moment when you judge the grains are cooked at the core but not too soft. Drain in a fine-meshed colander. Wash the starch from the pot and put it back on the top of the stove to get it completely dry. Heat two tablespoons of cooking oil in the bottom of the pot at medium heat before heaping your rice into it. 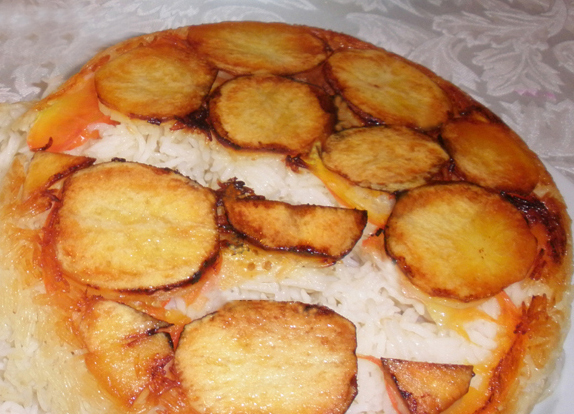 You could put a piece of bread, slices of potatoes, or simply the rice to make different types of tahdig. In a small pot, mix two tbsp of water and two more tablespoons of oil and once heated, sprinkle it over your rice mound; this will help produce more steam at the outset and keep the grains separated. Make a hole in the middle of the mound with your spoon’s handle and cover the pot with the lid. When you notice steams building inside the pot, wrap the lid in a clean kitchen cloth and replace and let it stem-cook for at least an hour. 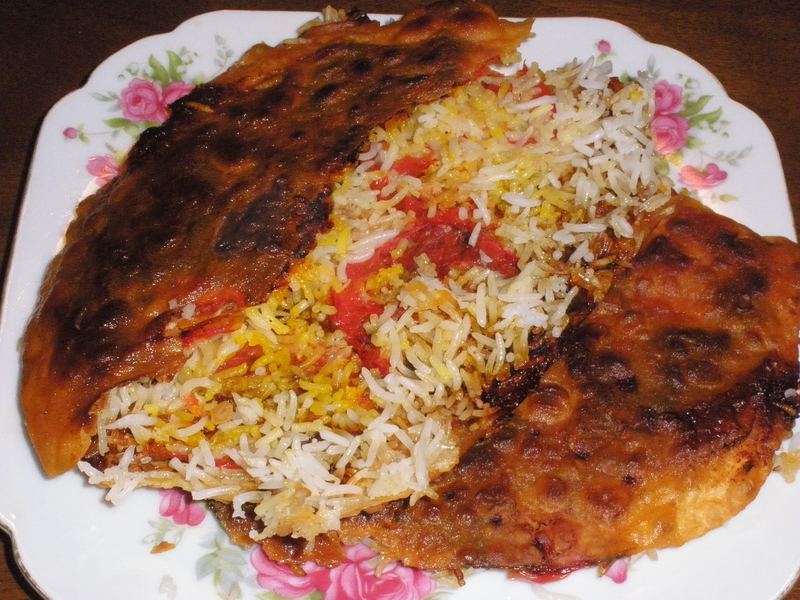 This is called, dam kardan – the secret to the unbeatable Iranian-style rice cooking. خود برنج مهم نیست اصلا، مهم ته دیگه! البته من فکر میکنم در مسئله مهمه ته دیگ یک سری ریزکاری های دیگری هم در کنار دم کردن قرار میگیرن مثل استفاده از زعفران البته به اندازه کافی برای دادن طعم و رنگ! Now I wonder… how would it taste with tomatoes… hmmmm… might tase like istanbuli polo. Nice. I’m going to try that today. Thanks a lot for sharing the idea.